Pesto, pesto, pesto, 3 cheers for pesto! Pesto rocks! Not only is pesto healthy, but it also has endless uses. Top it over hot or cold pasta, throw it over some pizza dough and make yourself a green pesto pizza, spread it on some cold or grilled bread for a different take on garlic bread, top your favorite meat or fish with it. You get where I’m going here, right? Pesto is such a versatile sauce in the way it’s used and the way it’s made. There is arugula pesto, parsley pesto, broccoli pesto (I have made this before and topped it on quinoa, that recipe later). 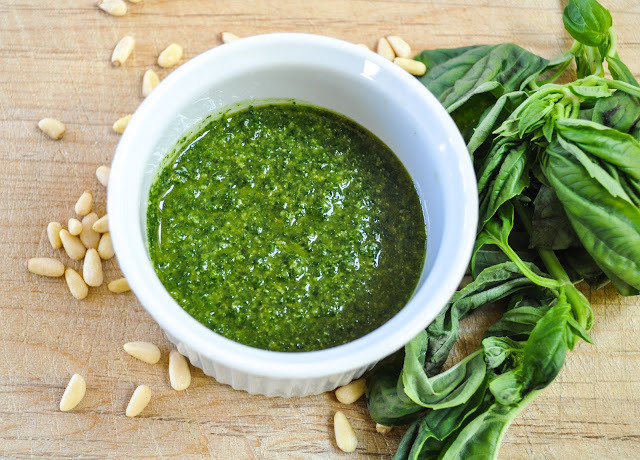 Have you ever made your own pesto before? It’s super easy and so worth it. If you do make it on your own, the great news is that pesto freezes exceptionally well, so you can make a big batch and store it for future use. I usually make up 2 batches and then use one that week and freeze the other batch in a small glass container. 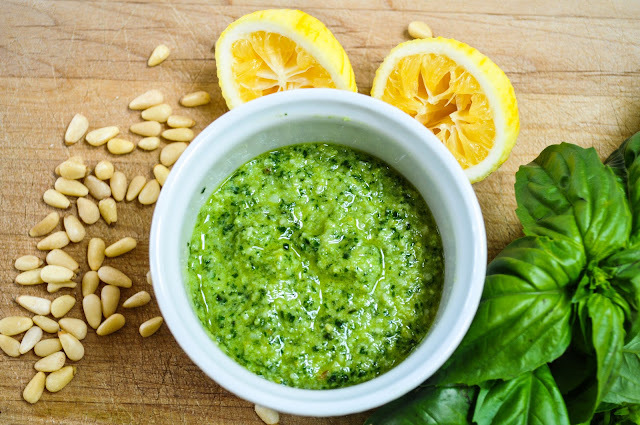 Below are 3 of my favorite go-to pesto recipes. 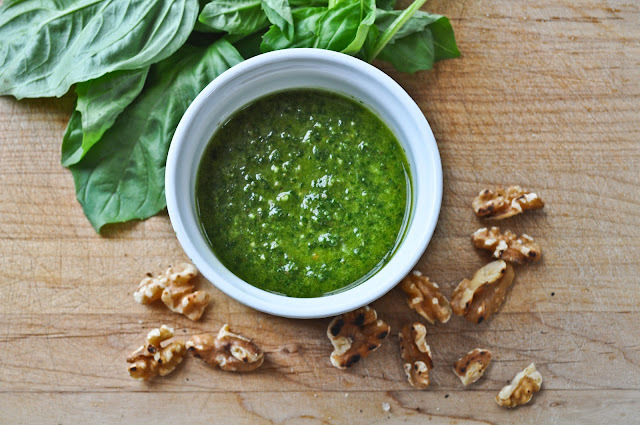 If you’re looking for a dairy free one, try the walnut pesto. BTW, I don’t have a big food processor and have made all of these pestos in my mini-prep. This pesto is wonderful paired with this lentil meatball recipe. Add in the 2 cups basil leaves and 1/2 cup olive oil until you get a smooth, sauce-like consistency. Add 2-4 tablespoons of water to thin as desired. I used 4 tablespoons, as I like my pesto be a bit thinner. This is optional of course. Stir in the parmesan and set aside. The sauce will keep covered in the fridge for about a week. This pesto is wonderful paired with pasta with sausage and broccolini. My favorite way to toast nuts is by using a dry skillet. Some people like to toast them in the oven, but the frying pan seems to work better for me. Heat a medium sized frying pan over medium-high heat. Add walnuts to the hot,dry pan and cook, watching constantly and stirring frequently, until walnuts start to brown and smell toasted, about 5 minutes. Let the walnuts cool. Process and, while motor is running, drizzle in 1/2 cup olive oil to form pesto; set aside. Note: If you don’t have a large food processor, like me, and only have a mini prep, then you can put all of the ingredients plus the 1/2 cup olive oil into the mini prep and whiz away. 1/4 fresh grated parmesan or pecorino romano cheese – I used parmesan here and I add this to the pesto an hour before I am going to use it. Pulse away till you get a nice consistency making sure to scrape down the sides of the container if necessary, then add the rest of the oil gradually. If you want a thinner mixture you can add more olive oil. I thought that the 1/2 cup was plenty and the pesto had a perfect consistency. Pour your pesto into a container and store in the fridge till needed. Add the freshly grated parmesan an hour or so before you use it. This pesto can be stored in the refrigerator for a week or two or in the freezer for several months. We are pesto lovers in my house. We love it over cold or warm pasta and if were feeling carbed out we throw it on top of some quinoa pasta. Pesto is what got my kids to try and love quinoa pasta as it masks the flavor of the quinoa noodles. We always make sure to throw a veggie or two in the pesto pasta to make it a one-bowl meal. Roasted cauliflower, asparagus, broccoli or broccolini tastes wonderful paired with pesto. yummmm!! think you would enjoy pistachio pesto too…my fave! Sounds delicious Nina, please email me the recipe as I would love to try it! Beautiful photos. Your lemon pesto looks especially bright. I make all pestos with walnuts since they are cheap and plentiful at the Farmers’ Market. Besides the traditional one I make sundried tomato pesto and cilantro pesto. I make big batches, too, but never enough to last until basil season comes again. Hi Sharyn. I love cilantro and was planning on trying a cilantro one next. I just made a cilantro mayo the other day to top our turkey burgers and it was so insane. I think I could spend a lifetime just trying different pesto recipes! All three of these look great, but I’m especially interested in trying that Meyer lemon one! Hi Sue! The meyer lemon one is delish and tastes amazing on the lentil meatballs. I could eat a bowl of that everyday! We were just talking about pesto last night and how we need to make some!! I especially love the idea of the lemon one – Im getting so into throwing lemon in everything at the moment, just to brighten things up. I’m also crazy about pine nuts but Louis bought this pesto with almonds in it that was actually super good, so maybe we’ll try the first one with a mix. As you know Im not a huge pasta person, but we’ve loved having on roast vegetables too with tonnes of parmesan. AND we are going artichoke crazy at the moment. ooooh and we made this amazing sauce in school which I guess is like the south american pesto made with cilantro, some chili and tonnes of garlic – and olive oil. SO good! I need to shart sharing some of these recipes. Do you ever feel like there is just not enough eating time in the world?? Hi Em! I always love how your my first comment of the day! It makes my day! I know your not a pasta fan, but have your tried quinoa pasta or the pesto on top of plain quinoa? Yummy! John even eats it! Ok, you have to post that pesto recipe and some of these other sauces you make in school as well as that roasted cauliflower recipe. Maybe I can come over and photograph you making these recipes or you can come over here and we can do a buddy post. Wouldn’t that be fun? I should really have you link up with me when I make something super nutritional as you have all the scoop. I normally say, “hey, its good for you” and leave it at that. I hope next week works in our favor and we can meet up! So bummed about last week 🙂 Have fun on your day off today. Yes, lets definately discuss it and I am hoping the universe is on our side this Thursday. Same time and same place, or are you over mexican?